Are you ready to experience Shenzhen like an insider? Until now, uncovering Shenzhen’s secrets required a Mandarin interpreter and an English-speaking guide. Ideally, one with a passion for the city and years of experience, providing the nuanced background that really brings understanding and insight to a place. From the people who run Shenzhen China’s #1 resource, ShenzhenParty.com, they now deliver the only authoritative guide to Shenzhen that you will ever need. With a city like Shenzhen that transforms itself at break neck speeds, this book will make you more informed about what there is to do and see here than even a Shenzhen local. Whether you are coming to Shenzhen for a day trip, for business, or more, Shenzhen: The Book is the only resource you’ll ever need to make the most of your time in Shenzhen. Far from Xian’s Terracotta Army, or Northern China’s Great Wall, Shenzhen doesn’t normally come to mind as a destination on the tourist path. Yet, Shenzhen is an easy and rewarding adventure for a day trip, or better yet, a weekend adventure for anyone visiting Hong Kong. For real aficionados, even a week won't be enough time to experience it all. It is fair to say that even the locals, including cab drivers, don’t know everything you will find out in Shenzhen: The Book. 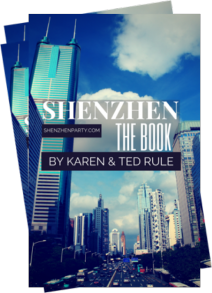 Even more, the authors, Karen & Ted Rule, are true authorities on Shenzhen—they've known Shenzhen since before it was a city. Ted & Karen first laid eyes on Shenzhen in 1971 when they took a taxi to the Lok Ma Chau police station in Hong Kong’s New Territories. Not much was there. But from then on Shenzhen became increasingly enmeshed in their lives. Karen was originally a historian by training and she immersed herself in the fascinating but little known history of the area. Ted expanded his already considerable waistline by sampling the culinary delights and sneakily recording them. And thus this tome was born. Where else are you going to get the kind of insights and perspective then from a couple who experienced the unfathomable growth of Shenzhen from the beginning of China’s economic reforms and Shenzhen’s boom? Shenzhen moves quickly. New skyscrapers sprout-up with no warning. Imagine how long it would take you to discover the nuances of this ever changing city. Nearly no one that lives in Shenzhen was born in Shenzhen. explore depth and dynamism of the local culture. Starting from your first questions about how to get around all the way through to accessing Shenzhen's hidden hotspots. Shenzhen: The Book—the resource many longtime expats wished existed when they moved to Shenzhen. It will help you avoid the most common pitfalls and “gotchas” that continue to plague Shenzhen first-timers and even long time residents. You can avoid the mistakes made by all new arrivals and tourists. Shenzhen: The Book shows you the way to access Shenzhen like an insider. All of that is possible because, with this guide, you will get the best, most-up-to-date and thoroughly researched information at your fingertips. That’s just a sampling of what’s you're about to access with the world's most up-to-date Shenzhen guide. From insightful anecdotes and how-to practicalities to local lingo and get-rich-quick lore, there's always more to discover in a city doesn't so much tick by but rockets forward at Shenzhen speed. regularly updated webpages about everything in Shenzhen. who watched the city grow with such impatient curiosity that you couldn’t help but explore every new corner of the fishing village turned metropolis, even while it was still under construction. Imagine. 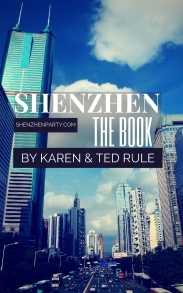 information about Shenzhen in one comprehensive authoritative volume ShenzhenParty.com’s Shenzhen: The Book is the long awaited resource - the one everyone wishes existed before. Connecting with others and learning from those who have been there is often all it takes to confidently integrate yourself into a new community. publisher, are not only your launchpoint for exploring Shenzhen but also your all access pass to a large community of travelers, expats and native Shenzheners that you can connect with. the right way. Now’s the time to really get to the heart of the city, get ready to experience Shenzhen like never before.